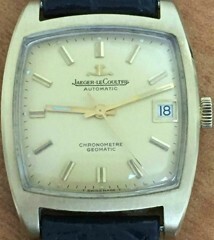 Jaeger LeCoultre Geomatic Deluxe Chronometere E560 K 883S Movement 18k Gold 1960s Historic Treasure! 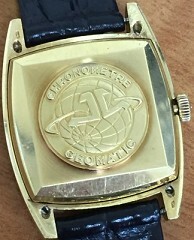 Geomatic Deluxe is the 18k version, which is s Chronometere-Date & automatic limited to 165 made with the better 23 jewel K 883S movement, hacking second & rapid date change first developed during the 1960s. Limited Edition, extremely rare collectible in this 18k Gold Deluxe model. 36mm x 42mm with lugs! This is a historic treasure & extremely almost impossible to find rare collectible & historic treasure! Museum collectible...Sell for $9,500 or trade! Payment Details: Checks OK USA... Bank Transfers ONLY WorldWide!